UChicago considers itself “One of the world’s premier academic and research institutions”. They may be tooting their own horn, but Students and faculty from UChicago have made great strides over the years, such as developing the first cloud-based computing system to process cancer data (in 2013) – I mean, wow. I still burn my popcorn in the microwave sometimes. With an average of 27,500 students applying every year, the UChicago acceptance rate comes in at only 9%. I already know what you’re thinking… 9%?! So what does it take to be part of that?? Check this out… It’s a chart of University of College Admissions statistics. See all those little blue and green dots? They represent the students that were accepted. And check out where they’re pow-wowing up around the top – it says “4.0”. 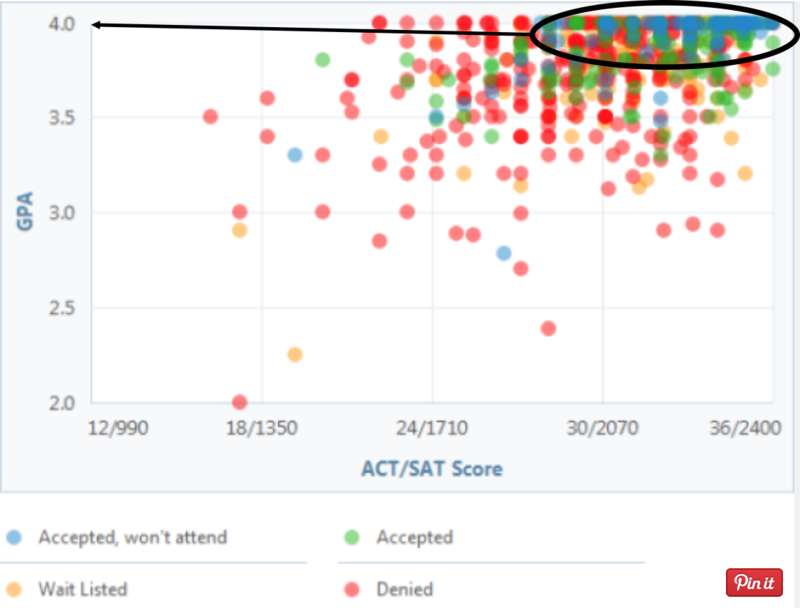 While we could argue that there ARE acceptances below a 4.0, and that the blue dots at the top represent students who didn’t attend, your student should aim for a 4.0 or higher to increase their University of Chicago admissions chances. Having a 4.0 or higher is also a good indication that your student will succeed at UChicago. The average GPA for students enrolled is 4.23! As we mentioned in our article on how to get into UC Berkeley, Ivy Leagues review their applications holistically, meaning they take all things into consideration. Ok, but exactly how real is this holistic approach?? 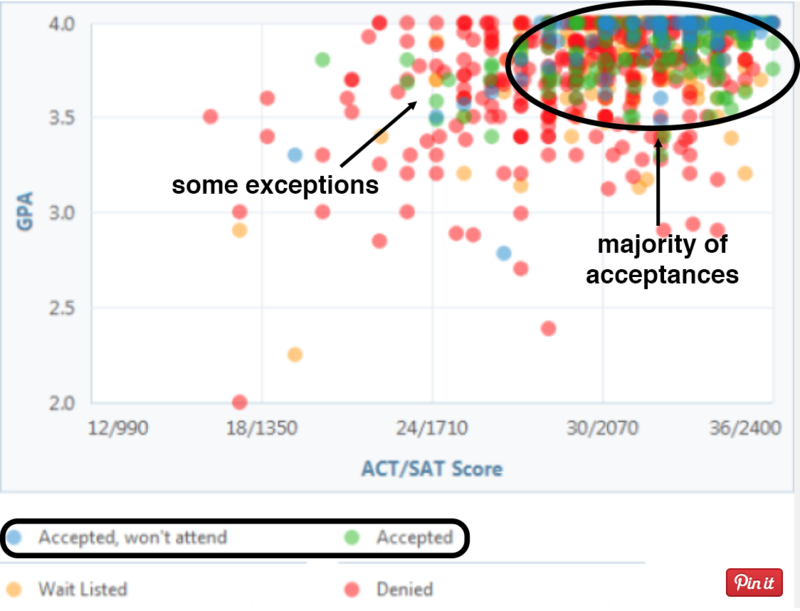 So in order to have the BEST chances of meeting University of Chicago admissions requirements, you should aim for the middle-ground (or higher) of accepted scores: a 33 ACT or 2235 SAT score. But what about the SAT subject test you may ask? No SAT subject tests are required for your application, but we’re going to recommend your student takes them… Remember the 9% admittance rate? UChicago Admissions are super competitive, so you really want to take every opportunity there is to stand out. Have your student study hard for at least two and submit those scores. And don’t forget about Super Scoring! The University of Chicago uses what’s called “Super Scoring”, (or Score Choice) when accepting your ACT and SAT test scores. It means that if you submit multiple test scores for either the ACT or SAT, they will take the highest score you submitted! THIS IS GOOD. It means you can take those tests multiple times to increase your score and increase your admissions chances! We’ve got something for this too! Remember our article on Extracurricular Activities increasing your Ivy League admissions chances? Well, UChicago is no exception to all that. 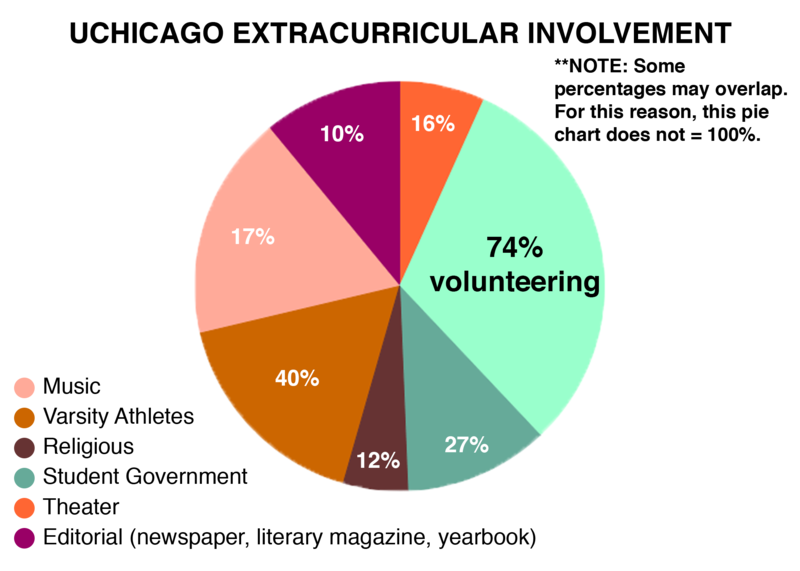 Here is a pie chart that shows the actual anatomy, if you will, of the University of Chicago in terms of their Extracurricular make-up. So what can you take out from this infographic above? What seems to be to focus? YES, you got it! It seems like there are three categories that are prominent here. I’m not saying these are the only extracurriculars that the University of Chicago cares about. BUT the fact that the majority of current UChicago students are involved in these categories does say something for the extracurricular habits of students accepted. So maybe you’re not an athlete and don’t play an instrument… But anyone can volunteer! AND there’s quite the variety of community service options open to students these days. Here are some Volunteer tips! Bring new or lightly used toys and stuffed animals to a children’s hospital. These are just a few specific examples I took from TeenLife’s 10 Community Service Ideas for College-Bound Teens and 50 Community Service Ideas for Teen Volunteers. A UChicago Account is simply an online account where you can access all the information you’ll need as both an applicant, and a student of UChicago. Get started with your UChicago Application. These are two different online application sites that allow schools to view student’s applications, and teachers to give college recommendations to those students. For filling these guys out, all you need to do is go to their homepage and follow the steps they give! Start your Universal College Application here and/or start your Common Application here. Now this is an important one so LISTEN UP! The UChicago Supplement is available through either your UChicago Account or Common Application. So what do these essays look like? You can expect to see (and write about) some pretty uncommon things on your essay. Literally, the University of Chicago takes prides in having uncommon essay prompts. What do they mean by using the term “uncommon”? How about a prompt asking you about the latest trends of society? Or a prompt that just catches you completely by surprise? The following were two REAL prompts used for the UChicago extended essay. 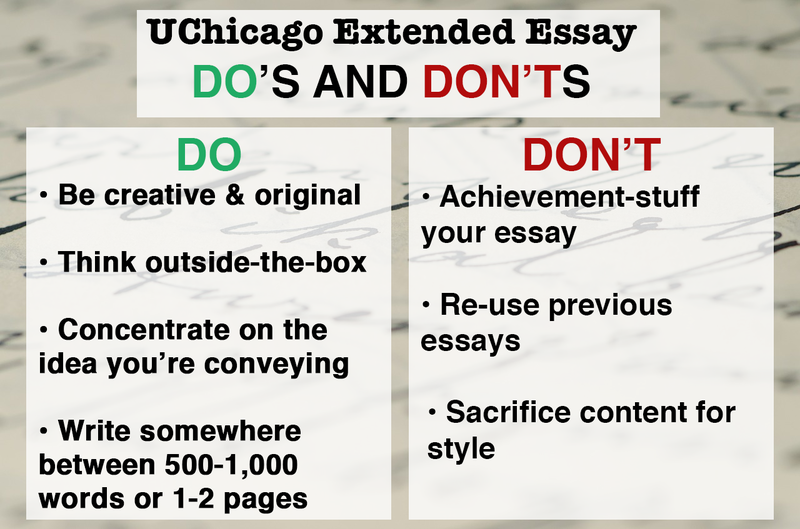 In other words, you can expect the unexpected when it comes to the University of Chicago extended essay. And here’s some specific examples of essay answers to uncommon UChicago prompts. Your student can read these and get a feel for the tone they want to capture and follow some of our tips we have provided below. Extra Tip: You don’t have to write about yourself to answer the question. You can, but it’s totally up to you! They want a secondary school report too? How about my right foot?? But remember at a 9% acceptance rate, you are being considered for one of the world’s premiere universities. So yeah, they want it. In another blog I talked about creating the “Ideal Candidate” for the school that your student wants to attend. 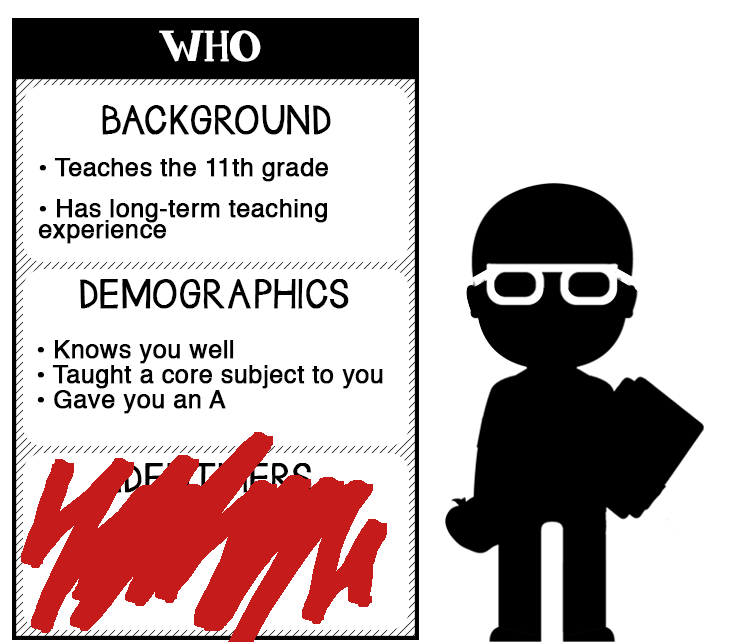 You can use some of those same categories to find the teachers for your student’s recommendations! Now that you know what kind of teacher to ask, make sure your student gives them plenty of time to write the recommendation. Teachers are busy. A week before the deadline is probably even pushing it, so give them 2 or more. And when you do ask for a recommendation, make sure to have a brag sheet prepared. A brag sheet? You mean you want me to brag about myself? Yup. Think of it this way: Let’s say you’re in a room with 10 people. If all 10 of you applied to the University of Chicago, that means only one of you would be accepted, if any. You need to do everything you can to BE that one! So your teacher needs to know your accomplishments in order to write you a stellar recommendation letter that stands out and fits exactly what the university is looking for. In other words… just follow the steps to fill out our Student Profile. Mid-Year report? Didn’t I already submit all my grades? Your student needs to ask their Academic Advisor to send a mid-year report with grades or transcript your first semester or first trimester by February 1, 2015. Their school may have their own form for this, or the counselor can use the UCA or CA’s form. Either will work — just make sure this gets done, and looks good! This means the supplemental criteria offered as an option for University of Chicago admissions. There’s a Portfolio in your student’s UChicago account where they can submit any type of artwork, writing, or anything else they are substantially proud of. This is another chance for your student to shine in the eyes of UChicago. So that portrait of Beyonce they painted in art, or that awesome mini-novel they wrote for English class… those will work. What about the UChicago Interview? 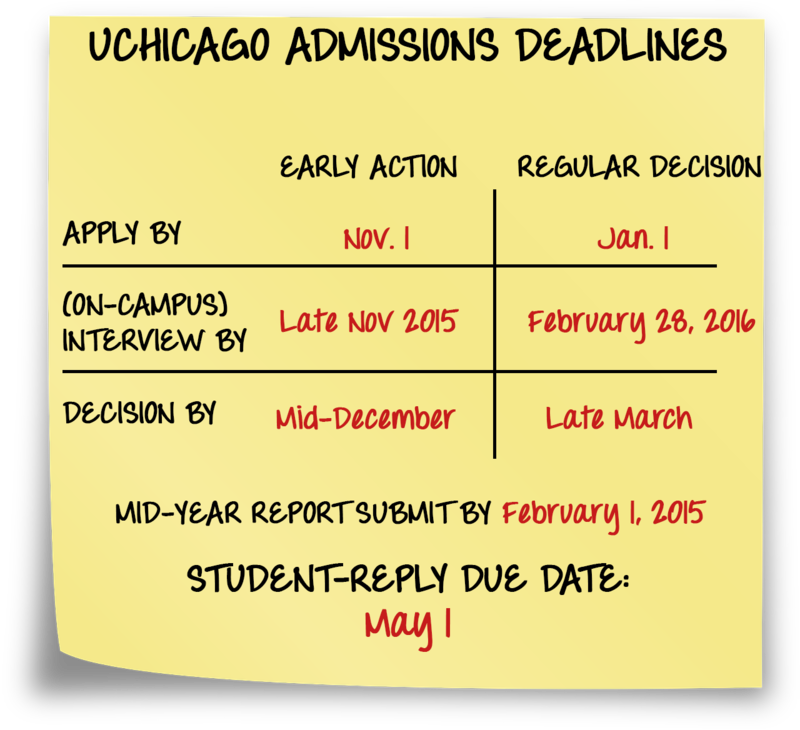 Interviews for the University of Chicago admissions are conducted on and off the campus. Face-to-face is always a good way to show your interest in something. That’s why I recommend that your student does one of these. On-Campus interviews your student is interviewed by a fourth-year student in the Office of College Admissions in Rosenwald Hall. And, guess what? The University actually has a current list of the UChicago student interviewers. When your student goes for their interview, they’re bound to see one of these lovely faces there. You can only book one or the other so your student can either schedule their on-campus interview or schedule their off-campus interview on their UChicago Account. That was a lot of steps huh?? Here’s the deal. If you don’t meet the deadlines for this stuff, NONE OF WHAT I JUST SAID WILL MATTER. — Make sure your student stays on track! Yes, UChicago has merit-based scholarships! However, they’re not exactly the same criteria as you’ve heard from us in reference to a merit scholarship. Basically how it works is when the University of Chicago receives your student’s application, the admissions counselors will review it for possible scholarship awards in addition to them being admitted. So they aren’t automatically awarded after admission, but they’re automatically considered. And they will look at everything: GPA, test scores, personality, and what you did in High School. They might even call your twice removed cousin and see what you did at your 2nd birthday… Ok maybe not that far, but you get the idea. If your student is found eligible for a scholarship, they can receive up to $15,000 per year. (The lowest they can receive is $5,000 per year). Just to keep things fresh, let’s review the steps we talked about. Know any other important details about the University of Chicago Admissions Requirements? Share with us in the comments below. Hey Todd, I am currently studying Political Science in Istanbul and I want to do my MA , specifically middle eastern studies, in uchicago. But i am not quite sure how much gpa is required. I would like if you could reply and help me. Hey, Aysel! Are you in college right now then? Our blog is mainly developed to help teenagers. Therefore, if you are in college right now I would not be 100% certain. Olivia, sorry for the late reply, it is tough to say since there are always exceptions. However, given where you currently stand you need to increase your ACT score to at least 32/33 to be competitive. May I suggest you take one of our assessment tests to see exactly what areas you need to work on. They are incredible exams that our team helped created here at Student-Tutor. I would love to attend this university it seems so cool!!! I’ve seen pictures of the campus and it’s Beautiful!!! I love it!! I’m just a junior in high school, in Texas, my biggest dream is to be an Architect. Hopefully I achieve all my goals I have set. If you’re curious about where you may stand currently as far as college readiness, check out our Celebrity College Readiness Quiz.